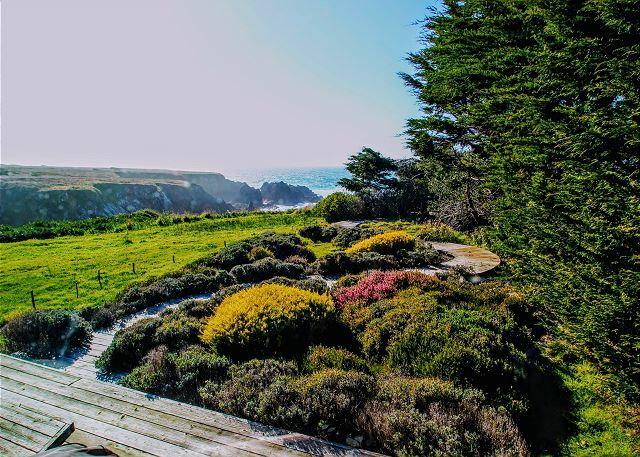 The Frolic, a delightful vacation rental -on the oceanfront of the Mendocino Coast – and just 3 miles from Mendocino Village – is charming, with convenient access to the beach at the foot of the bluffs, and with numerous modern amenities. With views of the ocean from almost every room & surrounded by the beauty of the coastal location, this spacious home provides a relaxing respite from the hustle and bustle of everyday life. Frolic Cove - just steps away from your front door – takes its name from the tragedy of the 1850 wreck of the clipper ship, “Frolic”. Laden with Chinese household goods and bound for San Francisco, the Frolic was a total loss from the storm; it remains one of California’s most important Gold-Rush-Era shipwrecks. The search for the lost ship resulted in the discovery of the riches of the redwood forests along the Mendocino Coast. You and your guests will be enamored with the idyllic (and convenient) location of this contemporary country cottage! Spend an afternoon hiking in the Point Cabrillo Light Station State Historic Park whose extensive property borders this home… or soak up the sun on one of several beaches located nearby. Just minutes away is downtown Mendocino, where you'll find a variety of shops, galleries, gardens, and restaurants that dot the streets of this picturesque community. With modern upgraded appliances, unique decorative accents, and the breathtaking views of the ocean, this seaside home is a charming twist on a classic cottage! Perched overlooking the cove and the ocean… and with views both east and west… early risers can watch the sunrise from the comfort of the wooden Adirondack chairs on the porch while sipping on a hot cup of coffee or tea. 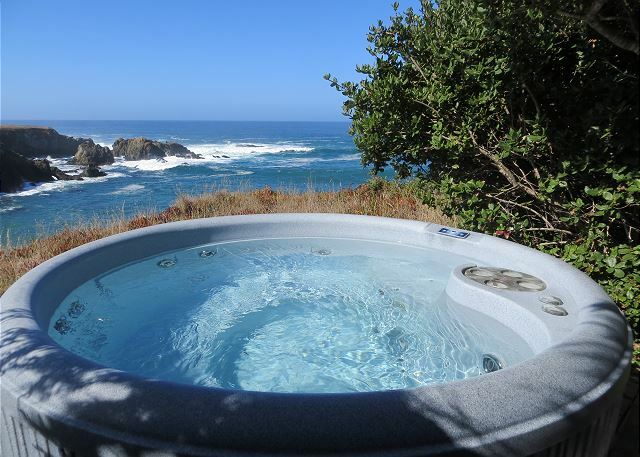 After a day exploring Mendocino and the surrounding area, spend an evening with a glorious sunset or wishing on shooting stars while you relax your sore muscles with a soak in the private hot tub! With two bedrooms and three bathrooms, this well-designed home is the ideal getaway for up to four people. The layout of the house lets you enjoy an open and spacious living space with the bedroom suites at either end affording the best of privacy. The newly remodeled galley kitchen is fully equipped, ready for anything from a mid-morning snack to a holiday meal. An outdoor charcoal grill makes a summer BBQ both simple and fun! There are plenty of seating options for mealtimes, both inside and outside. The living area is cozy and invites… curl up on the couch with your favorite novel or catch up with friends while admiring the ocean views. Both the living room and master bedroom boast a wood-burning fireplace! The master bedroom has a king-sized bed and the second bedroom is furnished with a queen bed. The stylish master bathroom includes a large tub and a separate shower. This home away from home offers a variety of amenities - sure to entice any guest - from the private hot tub to a flat screen TV. Recently remodeled, upgrades include zone heating for every room, energy efficient appliances, and many decorative details. If you need to bring work with you, the wireless internet allows you to stay up to date and connected to coworkers back at the office - or to upload pictures to Facebook to share with your friends and family back home. Sorry no children or pets allowed. The Frolic, a treasure you can discover again and again. To see all photos and details visit our website. Just spent our third visit in a Mendocino Preferred Vacation Rental and couldn't be more pleased with our experience. The Frolic, perfectly located with ocean views and wildlife, was spotless and well stocked with everything we needed for a great week. Don't hesitate for a minute to plan a perfect getaway here! You won't be disappointed. We've rented this home for over 30 years and it feels like our "home away from home." The setting is exquisite and the house open and comfortable. We fall asleep to the sound of gentle waves in the adjacent cove and spend each night on the back deck watching sunsets before heading out to dinner at one of the amazing local restaurants. We couldn't be happier with our annual stay and with this beautiful home. We had a thoroughly enjoyable time at the Frolic. We were there for 4 nights, our second trip there. The view is spectacular. Areas that need improvement: TV room is uncomfortable. TV is too small. The seating in the TV room is laid out wrong for 4 people and is very uncomfortable. Mattresses need to be replaced in both bedrooms. The kitchen supplies are sparse. Could use more glasses, dishes etc. The Frolic is the place to go to really relax and enjoy the sights and sounds of nature. The home is neat, clean and well appointed for a wonderful, carefree stay. We have stayed in Frolic many times and will return for a week of "going Mendo". Great time and weather. Deer and fox were in the yard on a daily basis. Looking forward to next year. The Frolic is an incredible place to stay. This home is absolutely incredible. When you walk in you look straight through to the ocean from all the rooms. The property is well kept, clean and very comfortable. Once you sit in the beach chairs outside and overlook the view you will be in awe and not want to leave and certainly come back again. Thank you for making our special weekend so memorable. We will be back very soon. Thank you for the review. We are happy you enjoyed The Frolic. We are sorry for any aspect of your stay that wasn't absolutely perfect and we wanted to let you know that the issues you experienced have all since been taken care of. The refrigerator needed to be unplugged and defrosted for a few days and we did not have the time before your arrival, we are extremely sorry for the inconvenience. The heater was an easy adjustment on the thermostat, but we are sorry it was not able to be fixed at the time of your stay. Thank you very much for the feedback and for being a valued guest. We love this vacation rental. This was our second visit. It has the perfect oceanside location. We enjoy hiking to the lighthouse and observing ocean life from the cliffs. The kitchen has everything needed and the hot tub is in a great location. We plan to come many more times in the future. This was our fourth stay at a Mendocino Preferred property and as always it was fabulous! Frolic is charming, fun and blessed with stunning views. Fully stocked with everything you need, clean and well maintained. The morning and evening deer visits are awesome! The hot tub by the ocean is also a big plus! Total privacy,spectacular views, very comfortable, perfect for one or two couples. The surf roars, the whales pass by, and, if you are lucky enough to be there in a storm the beauty of nature’s rath is beyond description, aided by the crackling fire radiating both warmth and security. We enjoyed our stay in the cottage, starting out with flowers and candies waiting for us at our arrival. The view of the ocean waves breaking at the sea stacks right in front of the cottage is unforgettable. The cottage is very nicely furnished inside. Deer visited us everyday, munching the plants and grass on the extensive grounds. Our only concern is the absence of screens next to the windows and sliding doors. Actually we had not seen any ties or mosquitos during our stay -- is that the case all year around? My wife and I rented the house for a week for our 25th anniversary. When we'd come back to the region in the past for vacations, we had generally rented in Irish Beach (near Manchester), but wanted something a little closer to Mendocino. The location is great. Right on the bluffs above the ocean and bordering the Cabrillo Light Station state park (/). Everything was clean and nice at the house, although it is a bit older. We had a problem with the hot tub blower not working, but that wasn't a big deal. The only problem with the location is that there is a house right next door. The bushes/trees screen you very well in the hot tub, so that part was private. Awesome views from inside with full windows all along the west side of the house to allow great views of the ocean. I love being so close I can not only see the ocean, but hear it and smell it. One bit of advice if you rent the house (at least in the summer), is to make sure that you let down the curtains in the living room and main bedrooms. The house gets hot from this during the afternoon and there are no screens on any of the sliding doors, so when you open them up to cool things down, you can get a few insects flying in (although nothing major). Great experience. outstanding views. Beds were very comfortable. Seating in TV room was uncomfortable, and outside Seats were way too weathered. Walkway was not ADA. We enjoyed the fireplace at night, more wood should be provided. Washing machine is on its last leg. Truly amazing, very private with breathtaking views. The photos just don't do this location justice! It is more breathtaking then you can imagine. We quickly changed our plans from going wine tasting to just hanging at the house. We sat in the hot tub at night under the milky way, listening to crashing ocean waves as the sweeping ray of the light house circled overhead. It was the highlight of our stay. The house has everything you need to cook and be comfortable. We also had a few extra visitors - a fox, a few deer and some birds. This is a perfect place for two couples to stay and I highly recommend! This was one of those vacations where you did not need to leave the place to be on vacation. We hiked the trails in the bordering park. We relaxed in the hot tub. We sat and read on the deck. Just a perfect spot for relaxing. The sound of the waves and the beautiful sunsets just kept you at the house. We will be back! 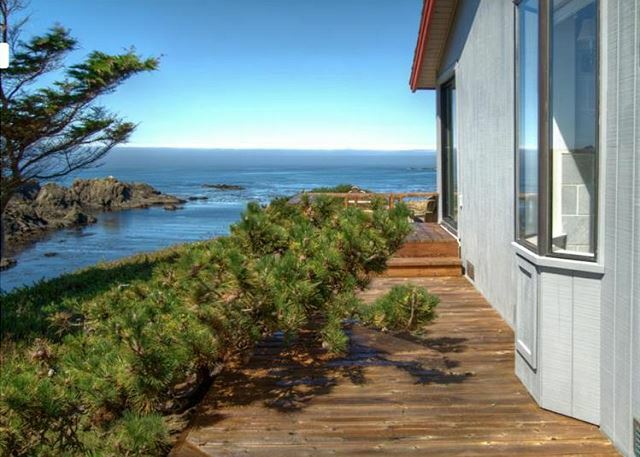 Lovely Cozy Mendocino Coast Escape! I visited the Frolic with my husband and another couple over the 4th of July weekend. We were so charmed by this adorable and cozy place that we ended up staying in and cooking all of our meals there instead of going out to eat as we originally intended. The common space with a working fireplace was great for games or hanging out, and we liked that the TV was in a separate TV room. The bedrooms and bathrooms were nice, with one bathroom very recently redone in great style. Also, the hot tub right on the cliff's edge was out of this world! Working with the rental agency was a breeze. We can't wait to come back. The pictures didn't do this vacation rental justice. It was absolutely breathtaking. Views of the ocean from almost every room. We will definitely return. We have stayed at the Frolic many times... we love the location and the privacy and quiet, except of course for the wonderful sounds of the waves, and birds and sea lions! The Frolic could use a few upgrades including more comfortable dining chairs, pillows for the deck chairs and a new set of dishes. 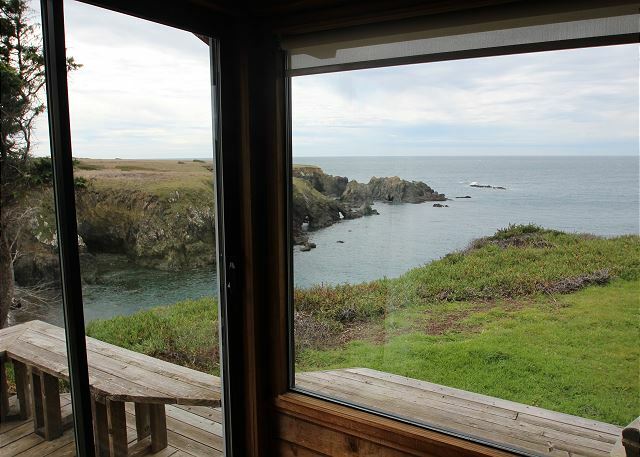 That said, it is the ideal getaway in Mendocino. Outstanding location and views. Extremely comfortable for 2 couples. Very clean and spacious. 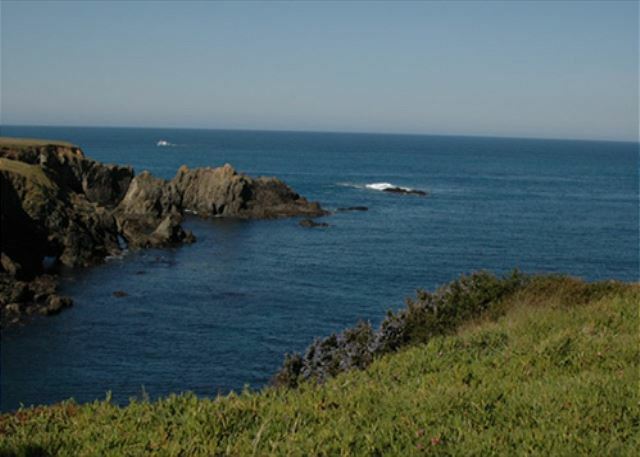 Close to Mendocino and Fort Bragg and wonderful hiking. Very quite neighborhood and private. I rated 'condition' down a bit because of problems with lighting. None of the light switches in the big bedroom turn anything on (even the first bedside lamp doesn't work), dining table light didn't work even when we replaced the bulb. Had a great time at the Frolic. The trails, hot tub, house, etc. were great! We did miss not having a TV in the living room. Overall, would do it again as the Frolic has a great view and location. We enjoyed 7 days at The Frolic but the three storms were fierce. Nice to sit in the front room and watch 45-50 foot waves hit the rocks. Lost electricity once for 3 hours but started the fireplace in the front room. The staff was helpful and brought out an emergency kit with candles which we used. We weren't able to use the spa due to the high winds, but our next trip will be later in the year so we can give the spa a try. The minute we stepped into the Frolic and saw the amazing views through to the ocean , we knew our stay would be wonderful. The views towards the sea are virtually from every room! And although we had mostly rainy weather the bonus was seeing a waterfall off the bluffs from the biggest master suite. We stayed four nights over Thanksging weekend with our daughter and son-in-law and the home offered great privacy as the master suites are at opposite ends. It also had a well stocked kitchen with everything we needed. 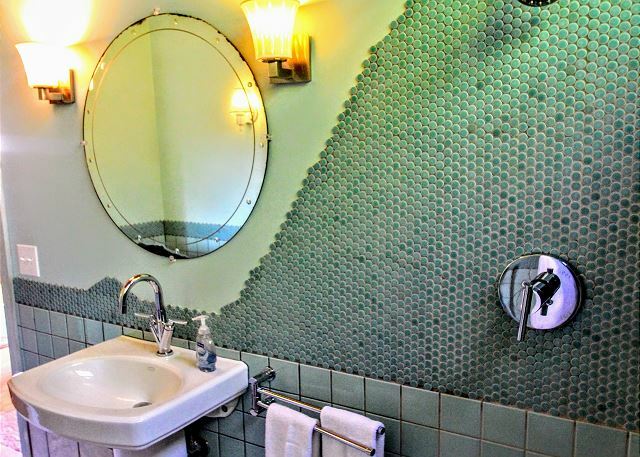 The bathrooms, all three, were totally modern and spotless. 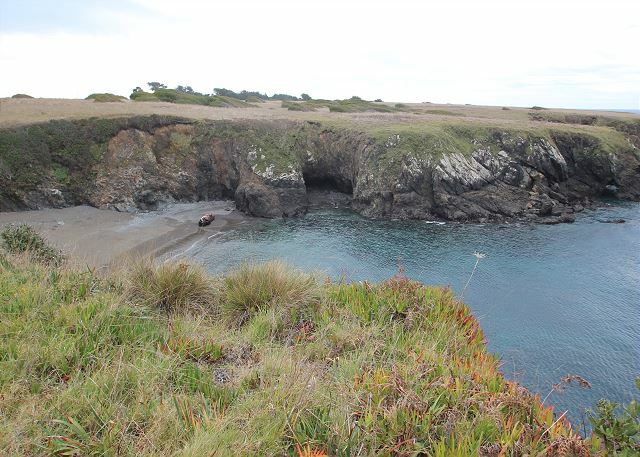 Also loved the location..close to Mendocino and 10 minutes to Ft Bragg. Looking forward to coming again and doing more walking on the headlands in better weather. We also loved the jacuzzi! It really was private and just as the picture shows it, right near the edge of the cliff....beautiful, even in the rain! A couple of issues were needing more dry wood for building fires, and the WIFI connection, however, we Can't wait to come back! Mendocino Preferred was wonderful to work with, another bonus of our stay..thank you..
We have been coming to Mendocino for 20 years and SS Frolic has been our favorite place to stay for 10 of those years! Ocean gazing, star gazing, relaxing, walking the lighthouse headlands are all primary on our list and are some of the benefits of staying at the Frolic. It is our home away from home. We have stayed at S.S. Frolic over 10 times and this time was great again. Flowers, Cognac, wine in fridge, wine and champagne glasses, no mice, calling to check on us and new sliding door in master. light in guest closet doesn't work - no cord -you really need that to work so you can see since we use both closets, oil in skillet in cabinet. This was gross since oil was left in the pan and never cleaned out - need to check all dishes and pans in kitchen before arrival, broil pan in oven was not clean (two pieces), coffee maker was dirty with old coffee grounds on inside - had to rinse the entire coffee maker out, sliding dinning room door is very hard to open. We used to bring WD-40 silicon spray but forgot it - still it should be sprayed before guest arrive, outside light off master doesn't work, toilet in guest does not flush unless you hold the handle down and it is leaking from inside tank. Our stay was unique as we traveled with aging parents who weren't able to get out and do much so the sea view was their entertainment. For that purpose the property was perfect and the view spectacular. Personally it was a bit too close to the edge of the bluff for my taste. Truly 30' from the edge of the deck to over the cliff's edge. We recommended a new BBQ aa the one there wasn't safe to use. I recommend whichever of you who gets up early takes the room right off the kitchen as noise travels to that bedroom. Resident deer were very enjoyable to watch. House was well furnished. Take your binoculars. My family really enjoyed staying at The Frolic. It was clean and provided us every amenity we could possibly want! We were pleasantly surprised to see ground coffee in the fridge but had already brought our own grinder and coffee for the weekend. Honestly, the views alone and the hot tub looking out over the cove and lighthouse are worth every penny! The only thing that was outdated was the website that provided instructions / key pickup information. I kept checking the email on my phone which was supposed to provide instructions for key pickup but I didn't see anything so I just hoped that everything would work out when I got to Mendocino to pick up our key. Between the rental agreement, confirmation and receipt I felt like I had to dig through all of it to find the key code to get into the key box. I think it would be better to have the key in a lock box at the home rather than in Mendocino. The website and email formatting could really use a face lift--it's confusing and it's hard to navigate. Again, not a deal breaker just something that could be improved. Thank you very much for the review, we're very happy that you enjoyed your stay. We're also happy to report we are in the process of updating our website, so if you stay with us again in the future it will be a much smoother process. Thanks again! We love the house and the view. Really nice to have the park and beach right next door. Had a great time watching the deer and the osprey. The house is wonderful but really needs a deep cleaning. There are a lot of spider webs and dust on the blinds, etc. We'll go back, but it would be terrific if the place had a good once over. My wife & I stayed at the Frolic for three nights with my parents, and the house was a perfect retreat for us. The setting is spectacular, and the fact that we could walk right into the Point Cabrillo Light House historic park was a bonus. 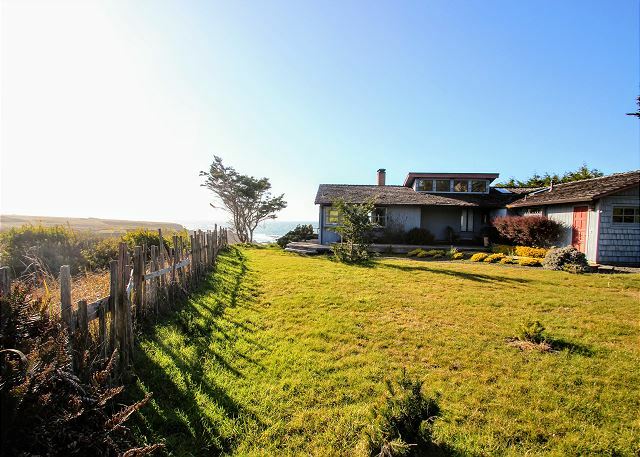 The house is about 5 minutes north of Mendocino and was a perfect base for exploring the Mendocino/Ft. Bragg area. We found the house exceptionally clean and the kitchen was well stocked with dishes, cookware, etc. They also provide coffee and tea, but no other "staples" (and the property mgmt company asks you leave nothing behind). So, if you plan to cook and need things like oil, spices, etc., be prepared to stop by the Harvest Market in Mendocino to pick up supplies. The layout of the house was perfect for us -- two good-sized, en suite bedrooms at opposite sides of the house. My parents, who are early risers, could get up, make coffee and relax without disturbing us. The house is also surrounded by wildlife -- deer were constantly wandering through. The house really is right on Frolic Cove, so named for the ship which sank in the cove in 1850, so bring warm clothes, even in summer. The cool ocean wind is strong and chilling. Oddly, none of the windows on the house had screens, so cooling the house off also meant letting in some bugs. We would definitely stay at the Frolic again -- it was comfortable, clean, well-located and the view can't be beat! The property was exactly as described, but so much more than we had anticipated. The ocean views were fantastic, they are much more than can be captured in a photo. The views are available in every room in the house. The house was clean, met and exceeded any expectation we had of the accommodations and availability to nearby attractions.